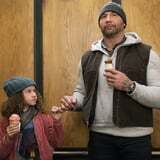 Actor Dave Bautista is tackling a challenge that his Guardians of the Galaxy character, former intergalactic criminal Drax the Destroyer, could never handle: a precocious 9-year-old girl. In My Spy – directed by Get Smart‘s Peter Segal – the former WWE champion plays JJ, a hardened CIA operative whose preference to blow up things now and ask questions later, has led to his demotion. His new assignment sends him undercover to watch the family of 9-year-old Sophie (Chloe Coleman), who discovers JJ’s operation using her own tech savvy. In exchange for Sophie not exposing JJ’s cover, she convinces him to teach her to be a spy (which includes walking away from explosions without looking back, of course). Though he’s virtually at the mercy of a young child, JJ quickly finds that he’s no match for Sophie’s brain and wit, and the two find themselves getting attached to one another. My Spy‘s cast includes Ken Jeong (The Hangover), Kristen Schaal (Bob’s Burgers), and Parisa Fitz-Henley (Harry & Meghan: A Royal Romance), and from the trailer alone, it’s obvious that everyone is bringing their comedic best. Not only do we get to see Bautista be bested by a little girl literally half his size, but we also get to see him break out his interesting dance moves. That’s honestly more than enough reason for anyone to watch! There’s no a premiere date just yet, but check out the trailer above, and be ready to laugh when My Spy hits theaters in 2019.